Deepening the understanding of the work of Jan Sawka. 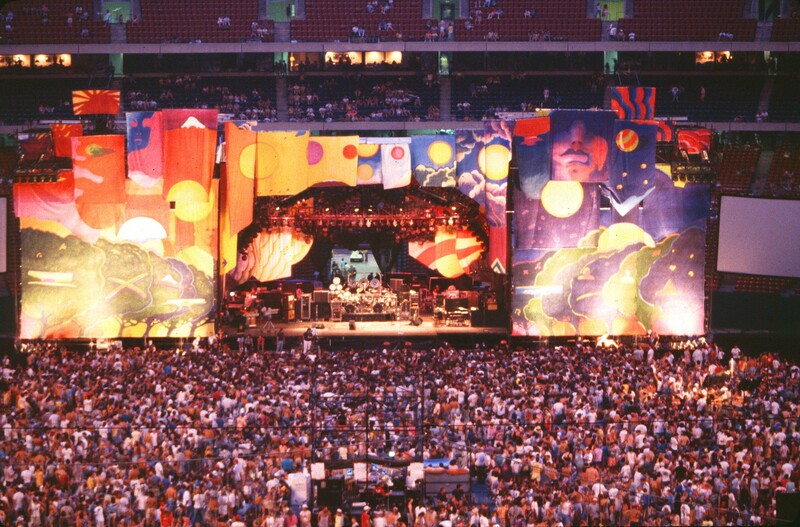 In 1989, The Grateful Dead, a rock jam band central to American counter-culture, commissioned Polish painter, designer and architect Jan Sawka to create a set that would transform giant stadium environments. This resulted in a 67’ – tall, 144’- wide and 47’- deep installation of multicolored banners, bearing images of trees, a sun/moon traversing the heavens, faces, fragments of landscapes and geometric patterns. Jan Sawka designed the set to accommodate giant amplification systems and lighting trusses. He created a stage within the stage that would set off the band, like a great theatrical proscenium. Jan Sawka’s beautiful and brilliant design set the stage for special lighting effects that highlighted, animated and changed the appearance of parts of the set during the night. What is more, the set could be reconfigured for different venues. Jan Sawka’s set continued to tour with The Grateful Dead for an additional year. This year marks 25 years since the set’s creation and installation. It is also the 25th anniversary Poland’s peaceful overthrow of totalitarian communism and the significant revolutions of 1989 that included the fall of the Berlin Wall, the first acts of dismantling Apartheid in South Africa and the failed, but significant, revolution of Tienanmen Square. In this article, I plan to examine the concert set within this broader context, especially considering Jan Sawka’s own participation in the Polish Solidarity Movement and his icongraphy. As the daughter of the artist, I hope to bring some new perspective into the meaning of this artistic installation. It had all started with concern from The Grateful Dead over stadium environments being inhospitable. The band was in its “mega-Dead” period, playing to the largest audiences in its history. This overwhelming popularity came with its drawbacks. According to Blair Jackson in “Garcia,” his biography of Jerry Garcia, “In the spring of 1989 Garcia had told a writer that seeing music in a stadium is ‘not a pleasant experience generally.” Garcia had added, “I don’t see why anyone would go to more than one of those shows myself.’” By the time of that interview, the band had taken action and Jan Sawka was already designing a set for the concert tour that would kick-off in the summer of 1989. 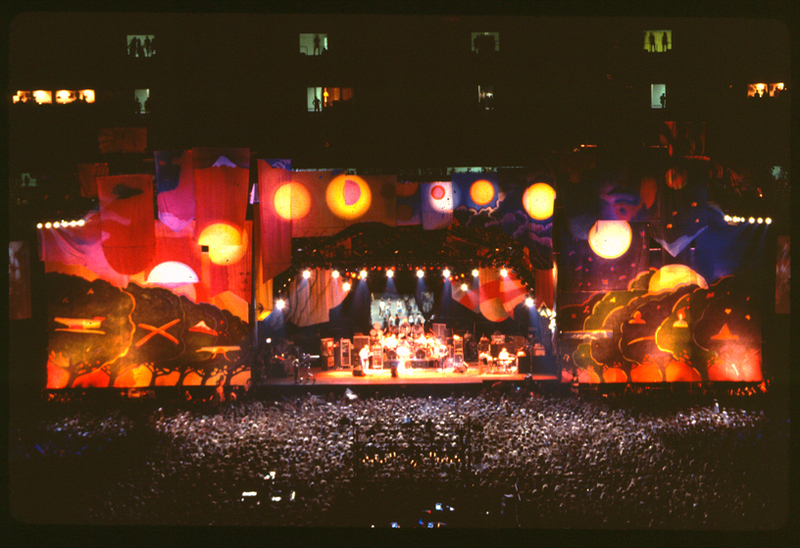 The Grateful Dead gave Jan Sawka complete creative freedom in designing the set. Quite possibly, this creative freedom given to a fine artist resulted in the only known non-commercial, fine-art installation for a rock band on a stadium scale, a unique instance of museum-quality art being created for mass entertainment. Jan Sawka was already known for creating symbols for various human rights causes, including the Solidarity poster that inspired millions of Americans to support the Polish Solidarity Movement and for his career in fine art print-making and painting. Jan Sawka again tapped into his ability to work symbolically, creating a vibrant design and iconography that represented the atmosphere of the Grateful Dead’s music, as well as the band’s activist interests, which were focused at this time on environmental concerns (at the time, the band was working to raise awareness regarding the need to conserve rainforests, a cause also close to Sawka’s heart). For Jan Sawka, it was a culmination of years of accomplishments as a designer for the performing arts and creator of art installations. As a set designer, he had worked already for decades with performing artists, beginning with the top avant-garde theaters of Poland, later with Samuel Beckett and off-Broadway theaters in New York. On a personal level, it was the story of Jan Sawka’s journey from oppression behind the Iron Curtain to finding freedom and fulfillment within the counter-cultural context of the Grateful Dead. He himself was a member of the Polish counter-culture. Like many people opposed to the totalitarian oppression of the regime, he sported long hair and jeans he had painted in bright colors. He would have fit right in with the scene in San Francisco’s Haight-Ashbury and his colorful appearance was in itself a statement against the system he was fighting. In 1968, while a fine arts and architecture student in the city of Wroclaw, he was a leader of protests against the communist regime’s anti-Semitic policies that the Soviet Union was implementing across its satellite states in response to Israel’s 1967 victory. For this, Jan Sawka was sentenced to service in a military punishment battalion. It was while thus imprisoned, in 1969, that he heard the Grateful Dead for the first time, with fellow-prisoners and counter-cultural activists, covertly using a military radio to tune into the illegal Radio Luxemburg, which was broadcasting the Woodstock Festival live into the Communist Bloc. Many members of the opposition listened to the illicit broadcast. The Woodstock Festival became another symbol of freedom and hope for those living within the giant prison of totalitarian rule behind the Iron Curtain. A few years later, as an artist and set designer, Jan Sawka would get permission to travel to student art, music and theater festivals in Europe, as part of the communist regime’s propaganda campaign to show Westerners that there was artistic and intellectual freedom behind the Iron Curtain (I’d like to note that this strategy was successful, convincing many that things were greener on the other side of the fence, or rather, curtain). Sawka would meet and, at times collaborate with or befriend, members of Western counterculture and creativity, such as Peter Schumann and his Vermont-based theater company Bread and Puppet, members of the English comic troupe Monty Python, and others. Despite being from different backgrounds, they found an understanding, and, without oversimplifying things, I can tell you from my father’s own recollections that they all felt they were from a worldwide community of creative non-conformists, often working to change their own societies or to at least create an alternative cultural space for people. In 1976, Jan Sawka’s political troubles had escalated, leading to the expulsion of our family from Poland and opening a new chapter in the West, where the majority of my Father’s artistic career would take place. Twenty years later, now an exile and an American citizen, Jan Sawka’s set for the Grateful Dead premiered the same year that communism fell in Eastern Europe and his native Poland became free, a struggle in which he had taken so much part. In fact, the first country to win its independence was Poland, with historic round-table talks taking place that year that represented a peaceful revolution. Months later, the Berlin Wall fell thanks to the changes that had started in Poland. For an artist who could barely dream in 1969 that he would find himself abroad someday (travel was impossible or restricted for most Polish citizens under communism), or that communism could ever end, it was a highlight year. “My Europe” addresses the tragedies of mid-twentieth century Poland, leading to hopeful representations of the future. One banner painting is a Polish flag whose fields have become a war-torn, bloody landscape, a representation of death and trauma. Another, “The Field,” shows cultural objects, both religious and intellectual, deep in shadow, along with ghost-like human faces – the remains of Polish Jews, Catholics and intellectuals who were killed during WWII. Jan Sawka’s family came from a highly targeted social group that was multicultural and intellectual and represented some of Poland’s most forward-thinking people – little of these people remained after what Jan Sawka often referred to as “the wheel of history” had come across Poland multiple times. Other banners present a hopeful look at the future, with three banners called “Awakenings” showing the darkness disappearing beneath beautiful, colorful landscapes, the converse of another banner that shows a red Soviet flag starting to descend upon and flood a Polish landscape with black fluid. 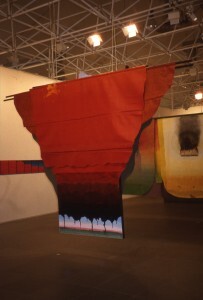 Invasion #2 (alternate title “Soviet Flag”), mixed media banner painting, part of “My Europe” installation at the 1992 World Expo in Seville, Spain. Awakenings, by Jan Sawka. This image is from the catalog. Please note the acknowledgement of Grateful Dead support at the bottom of the page. A year after the events of 1989 in Poland, Lithuania, a nation sharing a border with Poland and with deep-running historical ties, was the first republic of the Soviet Union to declare independence. Newly gained freedom meant changes across all areas of human activity, including sports. A general physical trait amongst Lithuanians is that they are a very tall people. Consequently, for decades, Lithuanians were selected to play basketball for the USSR at the Olympics, their height being an advantage in the game. Newly free, Lithuanians who had been stars of the Soviet team could, at last, play for their own nation. Like Poland, the recently occupied nation had no financial resources to send their team to the 1992 summer Olympics. Who stepped in to help? The Grateful Dead. The first basketball team of a free Lithuania would play in tie-died uniforms bearing the Skull Man. Having their team participate in the Olympics was a hugely symbolic and meaningful event for Lithuanians. These two instances of support to a Polish artist and a Lithuanian sports team illustrate how the band was supportive of freedom causes in the world. These two cases connected an American band with its own strong cultural significance within the United States to important movements in world history that ultimately led to the redrafting of the map of the world at that time. 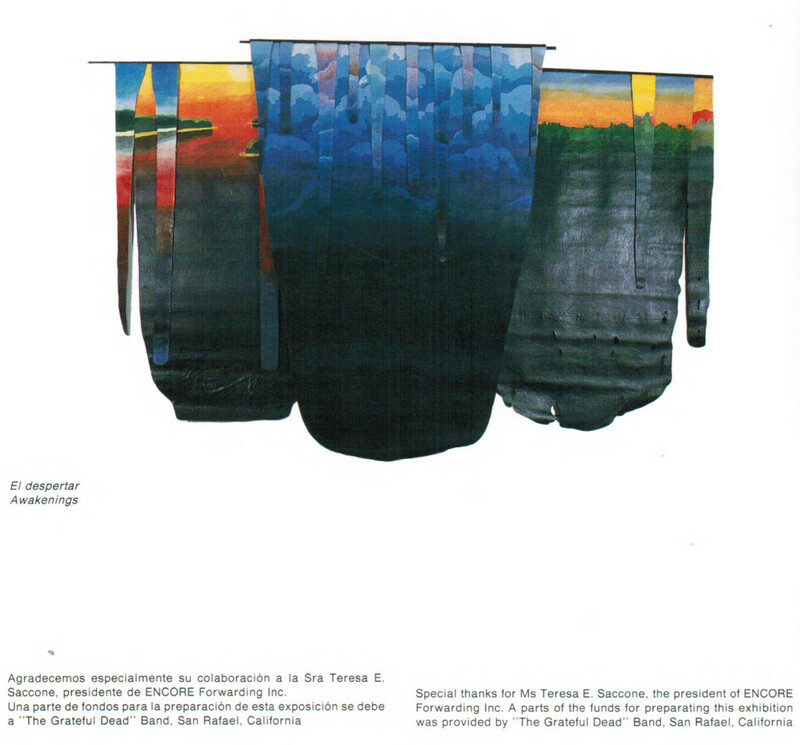 Returning to the case of “My Europe,” Jan Sawka’s aesthetic approach to the installation was very much in line with his work for “The Grateful Dead.” While the theme and specific iconography were different, as suited entirely different contexts, both the concert set and the Seville installation were comprised of banners. The struggle and recent history of Poland are presented on banners, while the environmental and artistic themes for the Grateful Dead also flew on banners. In the case of the set, this also allowed for a very practical application, but it meant far more than that. Banners had been appearing in Jan Sawka’s art across all disciplines at this point in his career and they had been present in his work for decades. The banner has a long tradition in Europe. It would be flown by knights and armies of old. Banners would be draped on castles, later on city government buildings. To this day, processional banners appear in the liturgy of the Roman Catholic Church, the predominant religion of Poland. Banners also were used by destructive powers, such as the Nazis or the communist regimes, to reinforce cults of personality or cults of state. Banners were all over the massive parteitag rallies that glorified the Nazi party in Germany. Banners with the faces of Lenin, Marx and Josef Stalin were a part of the landscape of Jan Sawka’s childhood. In fact, growing as a child, Jan Sawka would mostly have experienced banners used by the communist government. This was the totalitarian regime that had jailed his father for political reasons, overshadowing the first seven years of his life. The banners glorified a deadly system, one which imprisoned and tortured his father for being a socialist and progressive intellectual. Another early memory Jan Sawka had was of seeing, as his mother walked him to school, a man being shot in the street as he tried to flee the dreaded headquarters of the security forces, where most likely he had been undergoing an interrogation involving torture. In his earliest childhood, Jan Sawka had learned the brutal and deadly truth of the system glorified by the prevalent banners. 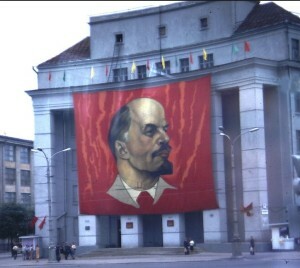 High impact graphic banners were used within the Soviet Union as visual reinforcements of the system, as well as the cults of personalities of Lenin and Stalin. Banners such as this one in 1980’s Moscow, were part of the childhood landscape of Jan Sawka’s Poland. 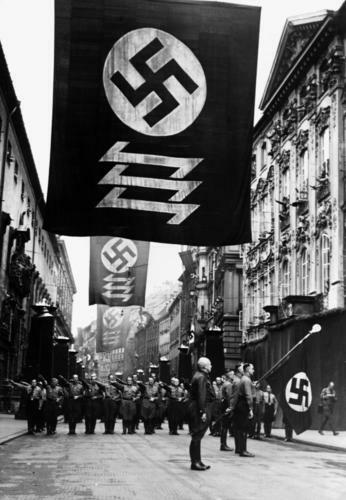 High impact graphics, including banners, were consistently used during the Third Reich during ceremonies and throughout the everyday landscape as well, serving as visual reinforcements of the system. Jan Sawka began to address banners from the earliest part of his career. In 1975, he created a painting titled “Avanti,” which was based on drypoint engravings combined with painting. 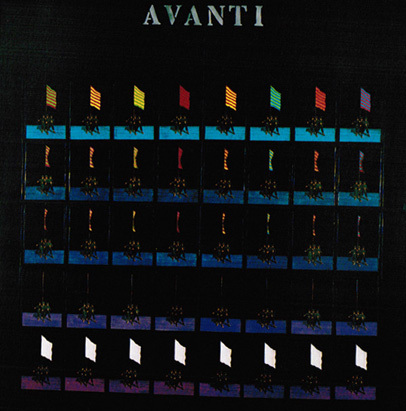 “Avanti” shows sequential images of repeating soldiers bearing flags. Initially, the flags are whole, but gradually have more and more material that has been torn from them, until their staffs have almost no fabric. A final sequence shows the same soldiers, this time bearing white flags of surrender. The banner that was meant to glorify a system that has sent soldiers out is empty, white – a system that is bankrupt or fallen. Another work from that same year is called “New Generation” and shows a young man with long hair bearing a blank banner. It could be another flag of surrender, or it could be a blank canvas, awaiting meaning. 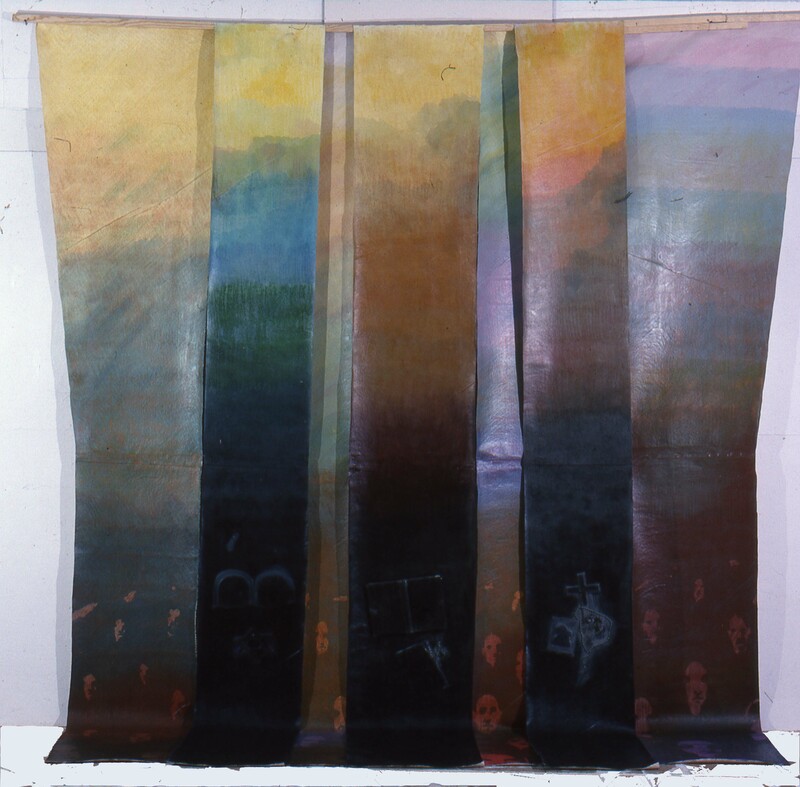 With time, Jan Sawka would develop the banner motif into a form where it no longer appeared as an image within a painting or print, but where the entire artwork itself was a banner, the loose canvas on which he would paint. In a way, Jan Sawka appropriated the oppressive banners of his childhood, transforming their meaning and purpose. Many of Jan Sawka’s paintings that are themselves banners show the deadly reality of self-glorifying systems. Blood and remains are spattered and spread across their canvases – a blood-stained shirt; small personal effects that were in the pockets of a person, now dead; a person lying face-down in a pool of blood; or a crowd fleeing bullets, some already fallen. There is a banner with a military general on it, but his face has been painted over haphazardly, as in a revolution. The banners show the struggle for change and even the process and history. Jan Sawka created many of these paintings within the same few years as the Grateful Dead set, the same period as the fall of communism. Among them are banners that show hope for the future, where a healthy natural landscape often symbolizes a future free of totalitarianism. 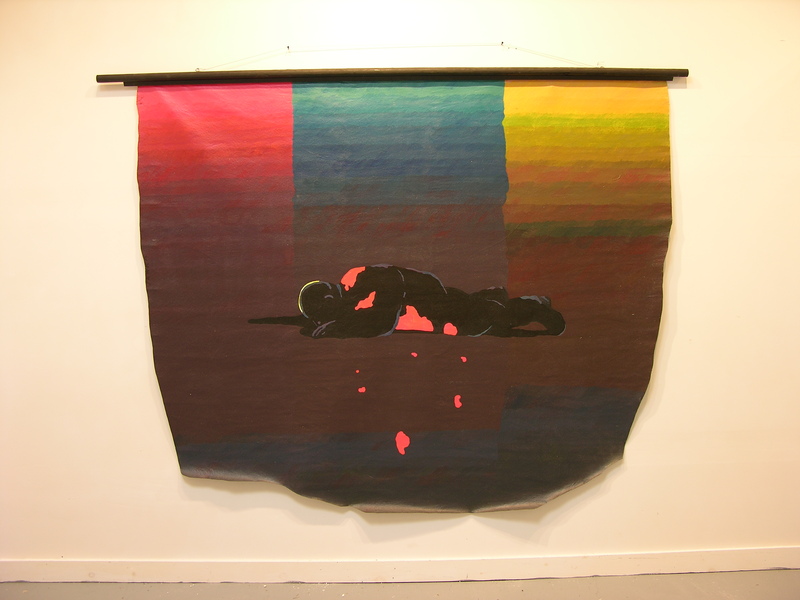 The Fallen, Jan Sawka, acrylic on loose canvas, 70 x 84 in., 1990. This painting shows a fallen person against the backdrop of a national flag, representing a totalitarian system. 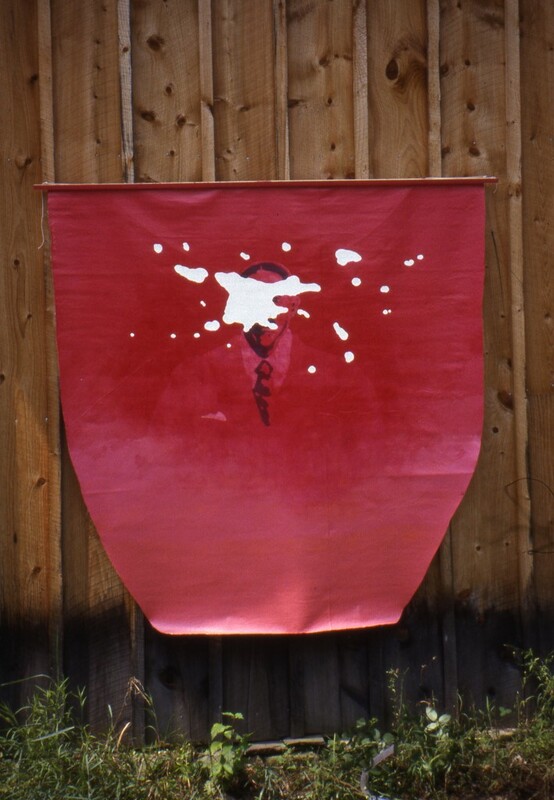 A banner painting from the early 1990’s by Jan Sawka that shows a leader on a banner that has been defaced, as was the actual case during the fall of Communism in Eastern and Central Europe. 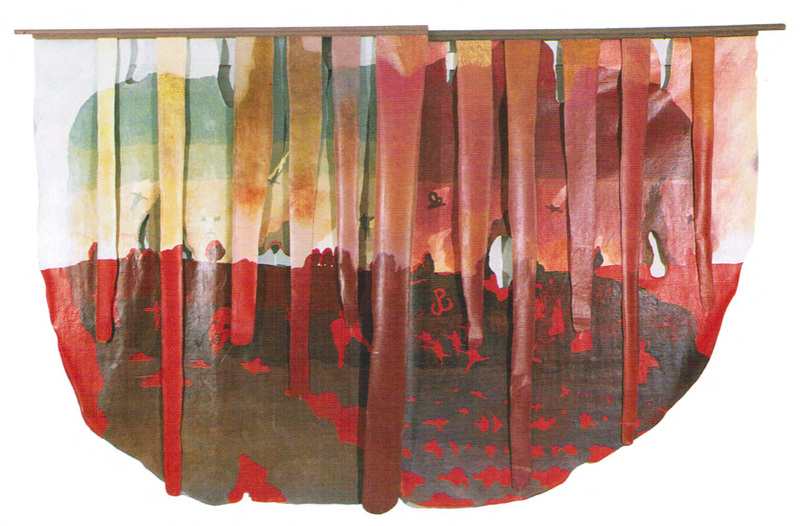 Eventually, Jan Sawka began to create banners that turned away from trauma and focused on individual human experiences, bearing faces and traces of a person’s life and memories and landscapes combined with figurative imagery. 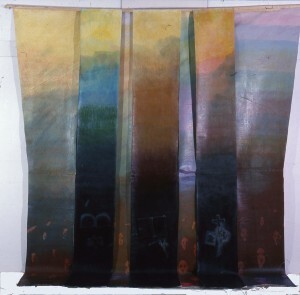 In effect, Jan Sawka had co-opted the banners entirely from totalitarian purposes, first by revealing the brutality of their totalitarian systems, then by transforming their form into artworks of beauty, with universal human and natural themes. In the world of Jan Sawka, banners would, from then on, represent humans, nature and other non-propaganda topics. The Grateful Dead set is such a case, with banners that have flown away with the colors and images of a creative imagination. 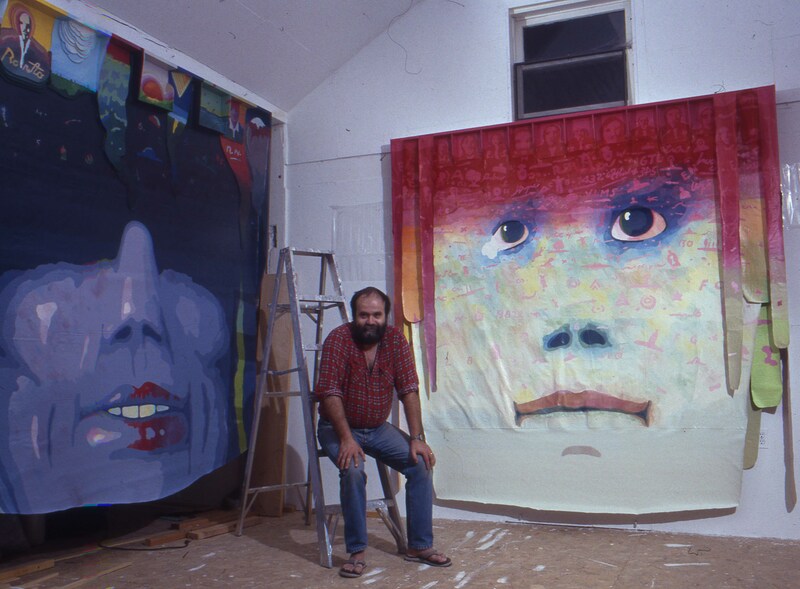 Jan Sawka in his studio in the early 1990’s flanked by two banner paintings with themes that are no longer political or having to do with oppression by the state. Painting titles are Face #1 and Face #2. In his “Power of the Not So Powerless” essay, while discussing Jan Sawka’s set design for the Grateful Dead, Jeffrey Goldfarb writes, “His work does not illustrate a social and political change. It is the change, as it depicts it. The main political meaning is not in the content of the artwork, though it has that, but it’s in the form of the art where the real significance lies. The art itself.” I agree with him and I would add that the very form of the banners used in the Grateful Dead set are no accident, they represent the artist’s affirmation of freedom. They comprised a 10-story-tall expression of creative liberation, forever obliterating the giant banners of oppression that had been the context of his formative years. There is plenty more worth investigating in the crossing of paths of Jan Sawka and the Grateful Dead, artists from counter-cultures that forever changed their respective systems. I will be presenting more on this topic, including never-before-published source materials at the “So Many Roads: The World Within the Grateful Dead” conference at San Jose State University in San Jose, California in early November. Please check the “news” page on jansawka.com and/or the Jan Sawka page on Facebook for more details on my appearance at this conference. This post has been published on August 9, 2014, to commemorate the two-year anniversary of the passing of Jan Sawka. This year is also the 25th anniversary of the fall of communism in Poland, as well as the 25th anniversary of the unveiling of the set Jan Sawka made for the Grateful Dead.